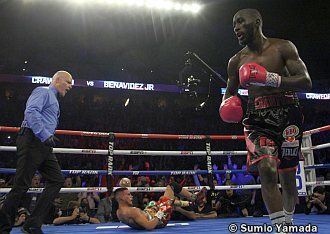 With just 18 second left in the 12-round WBO world welterweight championship, Terence Crawford unleashed a destructive barrage of punches to put an end to Jose Benavidez Jr., just seconds after knocking down his previously undefeated opponent with a crushing right uppercut. Referee Celestino Ruiz then stepped in to stop the bout at 2:42 of the 12th round. Crawford was ahead 110-99, 107-102, and 108-101 at the time he stopped Benavidez with 18 seconds remaining in the fight. Judge Levi Martinez scored all 11 rounds for Crawford (110-99). Judge Glenn Feldman’s card (107-102) had Benavidez winning three rounds. According to judge Robert Hecko (108-101) Benavidez won two of the 11 rounds. Crawford improved to 12-0 in world title fights. "Bud" showed more of his dominance after round six where he had a 103-33 edge in punches landed in rounds 7 thru 12. Round 12 was just amazing for the three-division champ as he connected 17 of 35 power shots. Crawford connected 70 body shots out of his 186 landed punches for 38%. Benavidez landed 8 punches per round. Crawford's previous 10 opponents landed 7 per round. But in the 12th round, Benavidez only landed 4 punches. In the undercard, Shakur Stevenson pummels Viorel Simion in one round as Stevenson (9-0, 5 KOs) decked Simion (21-3, 9 KOs) with a right hook in the first knockdown. The second knockdown was probably a slip. But the third knockdown was scored on another hook that hit Simion, 36, on the chin and sent him to the canvas. Referee Curtis Thrasher stopped the fight which turned to be a complete mismatch. The 21-year-old Stevenson, a 2016 Rio Olympic silver medalist from Newark, New Jersey, became the first opponent of Simion’s 24 professional foes to knock him out. Simion had only suffered defeats at the hands of Lee Selby and Scot Quigg, both have become world champions. The Los Angeles Lakers again thumped the Golden State Warriors as they closed-out their 2018-19 preseason, 119-105, in San Jose, California. The Lakers outscored the Warriors 32-16 in the third quarter as the Dub's bench could not deliver. The total score of only 44 points was contributed by the Warriors' bench while the Lakers bench scored 70. The Lakers scored 54 points in the paint to Golden State’s 24. Klay Thompson led the Dubs in scoring with 21 points, Quinn Cook poured in 20 points, while Damian Jones and Stephen Curry each added 16. LeBron James, Rajon Rondo, Brandon Ingram, Kentavious Caldwell-Pope, Josh Hart and Alex Caruso did not play for the Lakers in San Jose. Sviatoslav Mykhailiuk led the Lakers with 22 points, Kyle Kuzma contributed 19 points, while McGee chipped in 14 points. Lonzo Ball had eight points, six rebounds, and seven assists and Jonathan Williams pulled down a team-high 12 rebounds.